I have a 1999 Harley Davidson Dyna FXDL Custom with a 96cu torque motor. The engine is bored out to a 1550cc over the factory 1450cc, Jimms Hi-Compression pistons of 10:1 are installed. Its heads were professional ported and flowed with much larger intakes and exhaust valves including new brass valve guides. This is a beautiful high-performance motorcycle that is being sold by the original. The custom Harley Dyna lowrider for sale has only 3200 Original miles! 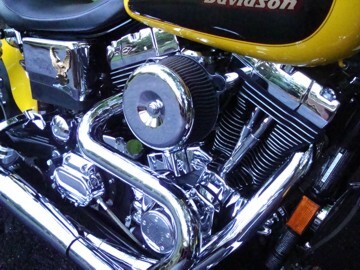 The engine of the Harley motorcycle for sale was built to have more torque than HP. It's a 1999 FXDL Dyna Lowrider and 1999 is the first year for the Twin Cam Engine. This motorcycle was special ordered from the factory with the rare color Pearl Yellow and Metallic Bronze paint option. It's the only motorcycle in Ohio with that color and I have not seen one since anywhere but this bike is about more than just a flashy custom motorcycle paint job. In addition to the other modifications listed above, the stock intake manifold has been polished and ported for better flow into the heads. The stock carburetor was sent to Dakota Carbs for reworking and jetting and they did an excellent job find tuning and adjusting the carburetor to the engine's specs. The throttle response on the 1999 Harley Davidson Dyna FXDL Custom is better than that of the fuel injection models. I also had a set of Screamin Eagle 204 Cams installed along with new cam bearings and bushings and a Screamin Eagle racing ignition with a rev limit of 7000RPM. The motorcycle has custom exhaust made by RB Racing. A 2 into 1 LSR-1 model with internal baffle and the suspension has been lowered about 1/2"
form stock up front and in the rear there are FOX Harley-Davidson shocks. You will see chrome refinements enhancing the look of the bike including a rear slotted aluminum rim and a front Thunder Star style aluminum rim with Conti-Blitz tires mounted. This bike is very solid and offers super strong custom performance. It produces approximately 1 plus horsepower per cubic inch and I have recorded the torque at 110hp at the rear wheel. The torque curve is very unique on the 1999 Harley Davidson Dyna FXDL Custom in that it comes on strong in the low RPM's and stays pretty constant up through the mid and just in the upper RPM's. In my opinion, the Twin Cam 110's are not as strong or torque driven as this engine has been built. This is a very clean custom motorcycle with no dents, scratches, dings, or pits that has always been stored and got a new battery this year. Currently it is on display, for sale in a dealer showroom in Canton Ohio. My reason for selling is that I am currently involved in another project and getting older. The motorcycle is located in Canton Ohio and I am asking $13,800.00 or might consider a trade for a muscle car project. If you are interested you may contact me for more pictures or info by leaving your questions and contact information in the space below provided by Strike Lightning Used Motorcycle for sale and the owner will get back with you to make an appointment or to answer your questions. Strike Lightning would also encourage bikers to submit a review of the 1999 Harley Davidson Dyna FXDL Custom for sale to help potential buyers make informed decisions and to benefit the biker community as a whole. Hi! I woulk like to see more pics of the bike and let me know what's your last price. Bet it's gonna hurt to let this one go. Nice!